No credit card required. No software to download. No obligation! Connect your existing voice, email, and Redis providers with a DragToCode script, and it's ready for action around the world. Designed by Google to teach programming, the blocks say what they mean, making complex business requirements clear and expressive. We handle the heavy lifting for you with logging, version control, and handling switching providers (like from Mailjet to Sendgrid). Use Blockly to create clear, powerful, cost-effective solutions without the need of a professional developer or server! Google built the interface, and we added blocks for email, SMS, queueing, voice, database, and more! Start anywhere. Simply plug in your own values and see your script in action! Focus valuable resources on your business instead of spending time on changing vendor interfaces. Change to another supported vendor with just a click. Create and modify complex phone interactions with a click. Creating voice applications and SMS processing has never been easier. Just drag powerful blocks together and form instantly deployable solutions! Values entered will only be used in the script and will not be saved or spammed. Keep In Mind: The full system includes a debugger and logger. 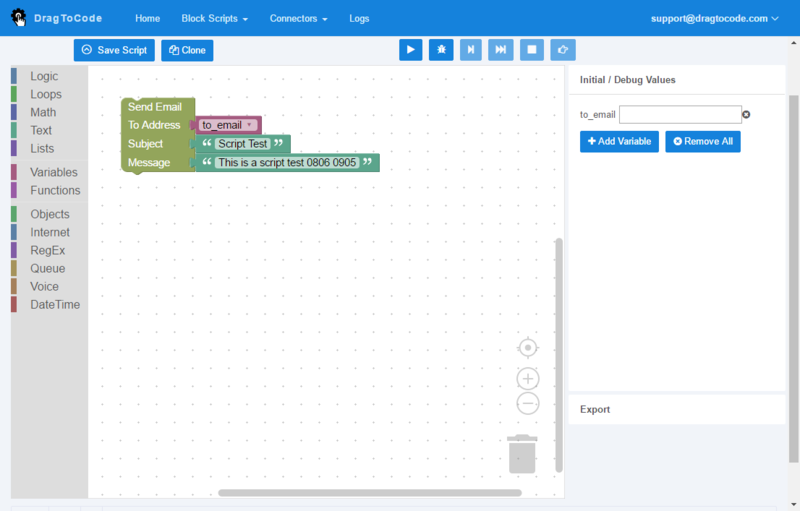 Experience DragToCode During The FREE BETA!